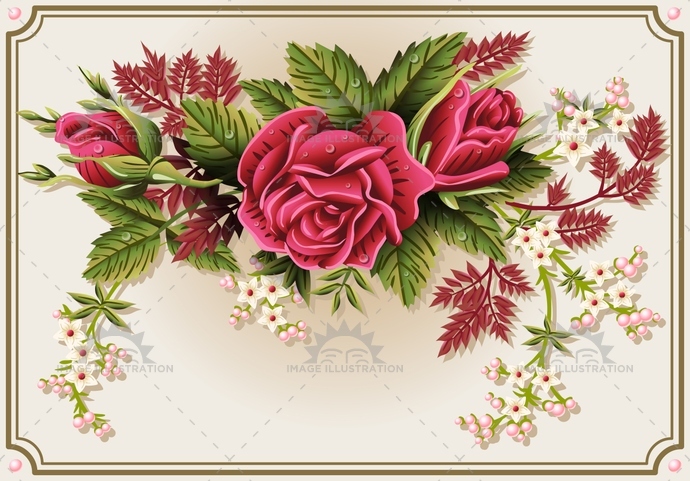 Stock product - detailed vector illustration - 2D Vintage Collection - Roses Frame 01 - created by Aurielaki. Image formats EPS AI JPG. Beautiful flower rose photo frame ornament. 2D rose hand drawn wedding invitation with red rose and label. Vector design, ornate spring motive. SKU: Roses-Frame-01-Vintage-2D-AurielAki. Category: Vintage Flower Vector Set. Tags: background, beautiful, beauty, blossom, border, bud, corner, decoration, design, drop, floral, flower, frame, green, illustration, isolated, leaf, nature, pattern, petal, pink, plant, red, retro, rose, roses, victorian, vintage, white.